It seems incredible to me, that it's taken 2 years to finally photograph a Banded Lapwing. 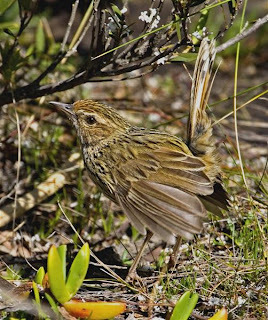 This species was once to be found widely around the South of Tasmania, being commonly seen at such venues as Sandford, South Arm, Richmond and Sorell. In recent years, I've seen a few around Bridgewater and heard the odd bird around Barilla Bay, but they're a bit thin on the ground. I could speculate on the reasons, but it's seems most likely to be related to drought conditions and changes in land use. I found a pair this morning at Kellevie, just to the East of Copping, with a single, half grown runner. It's a fairly late date to find them with young, often nesting as early as June, and as they usually have a clutch of 3 or 4 eggs, this runner is presumably the sole survivor. Much of this area is now improved and irrigated pasture, not the sort of habitat I associate with Banded Lapwing. I have rather missed seeing these plovers, as they're one of my favourites. My son and I used to call them "bandits", because of their likeness to the old cartoon drawings of masked intruders! heath, with dominant banskia on the western side, and low regrowth heath on the eastern. To the South, apart from Betsy Island, next stop is the Antarctic. Besides the bush birds, there is the occasional sightings of sea birds, such as Australasian Gannets, Short-tailed Shearwaters, and in storm conditions, the odd Albatross, mostly Shy. While birding here in the last few weeks, I've often watched distant raptors, some on nearby Betsy Island (named after the wife of Tasmanian Governor Sir John Franklin, in the 1830s), and others, 'floating' over the sand dunes to the West. Inevitably, they also hunt over the bluff, where the accompanying shots were taken. The Swamp Harrier (top 2 shots) was quartering the heath while I was taking shots of a Shining Bronze Cuckoo. I only noticed it at quite close range, as it hung briefly in the up draught. Floating on, it suddenly took fright at my presence, too close to get the whole wingspan in! As they say--"awesome". The second event occured a few days later, when this immature White-bellied Sea Eagle (at bottom), circled over the bluff as it climbed in a thermal. It was all over in too short a time, But at least I had a few images to relive the event. Reviewing the shots, I was struck by the huge area of their wings, particularly in the eagle. Both encounters a great addition to a day's birding. 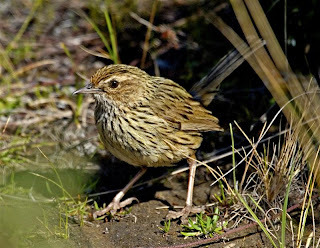 While watching and photographing a Flame Robin on Goat Bluff recently, I noticed a Striated Fieldwren feeding among the grasses on the edge of the narrow track I was standing on. I stood quite still, and eventually the Fieldwren app roached within about two metres of me, pictured top right. Inevitably, it finally noticed my presence, and ran back along the track, giving the display seen in the middle shot. Shortly after, it was joined by another Fieldwren, this one atop a bush, and this bird gave the display shown in the lower shot. I assume both displays would probably be described as distraction displays, that is, it was given to divert my attention, possibly from a nearby nest or young. Whatever it might best be described a s, I show the images here as I suspect it isn't frequently seen by birders (in Striated Fieldwrens), and even less often photographed. You can make your own interpretation of the meaning of these displays! It was only a year ago, that I was bemoaning the fact that I had seen or heard, very few Horsfield's Bronze-Cuckoos. Whereas, I had seen the similar, Shining Bronze-Cuckoos, at a number of sites, in varying habitats and in good numbers. Well, one year on, and I have already seen Horsfield's at Goat Bluff, Peter Murrell Reserve, Cape Deslacs, Sandspit River, Meehan Range, and the Risdon Brook Park. I've even managed to get a few reasonable shots of one, these taken at Goat Bluff, earlier this week. Further, by chance, I managed to get a shot showing one of the diagnostic features of Horsfield's, the rufous outer tail feathers (top image), lacking in the Shining. It proved to be fairly difficult to get close enough to photograph them. I heard the familiar call, traced the caller down, realised that there were two birds, which I presumed were a pair. One or perhaps both birds, used a "chrrrp" call, to keep in contact. They often flew past me, always travelling at high speed, in an undulating flight, usually alighting in the dense banksia scrub. Several times, being small, around 17cm, and cryptically coloured, I only found them as I flushed them, which added to the problem. With patience, I eventually managed a few shots. In the field, they were noticeably browner bronze, lacking the Shining's greener back. They also have a dark red eye, the Shining having a much lighter, orange red eye, but that's not likely to help you in the field! Why they're much more prevalent this year, or appear to be, I can't even hazard a guess at. Conversely, I've seen and heard fewer Shining than last year, perhaps it's just swings and roundabouts. The areas that I've found Horsfield's in, appear to be relatively open, with few mature trees (or none), and all have healthy populations of Brown Thornbills, which may well be the main host in Tasmania. I was having a somewhat frustrating day. I had set of for the Arve Valley, hoping to find and photograph, Scrubtits. Well, I found several, all in deep, deep shade, and not very co-operative either. 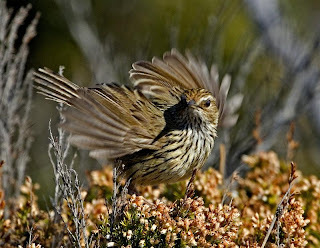 I had tried instead, first Tasmanian Scrubwrens and then a pair of Pink Robins. None of them wanted to play. Cutting my losses, I decided to look for Swift Parrots. 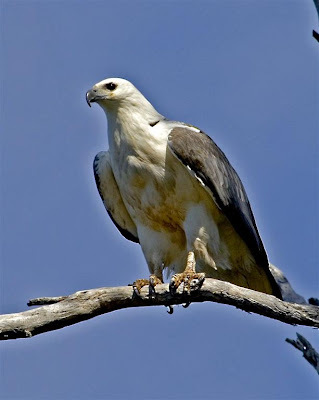 I had found a few at Port Huon on the way, high in the tops of blue-gums, being harried by a pair of Yellow Wattlebirds, and I had heard a distant flock in the forest near Geeveston. Bill Wakefield had mentioned seeing several in coastal trees around Gordon, and I opted to go there. By now the morning was nearly over, and from previous experience, Swift Parrots often roost in the middle of the day, and are more difficult to find. Several stops along the coast near Gordon failed to produce any Swifties, which was in line with the rest of my morning! I was just deciding whether to find an eatery or wait until I got home to have lunch, when I noticed a bird flying parallel to my car over the water. 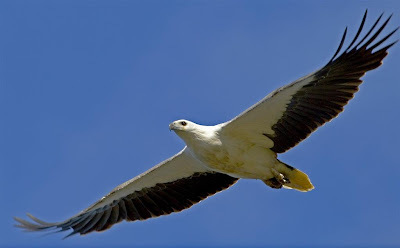 My first assumption was Kelp Gull, possibly from the nearby gullery, but cautiously switching my gaze from road to bird (and back), I realised it was a White-bellied Sea Eagle. Not only that, but if I drove hard enough, and got to the approaching small headland first, I had an evens chance of photographing it as it flew by. Well I beat it by a whisker, or whatever the avian equivalent is, parked (there are double white lines here, but it's a quiet road), grabbed my camera. I was ready! But the eagle had seemingly disappeared. Where was it? I walked back down the road, looking out over the bay, nothing. Then the penny dropped, it had landed in a nearby 'tree with a view'. I closed on the bird, but it looked a bit edgy and shortly took flight. I took several shots as it passed, which when reviewed as I ambled back, were terrible! I really was having a bad day. Fortunately, as I looked back towards my car, I could see the eagle, now perched in a tree alongside it. Take 2. This perch was photographically much better, and the eagle allowed me to photograph and watch it for 15 minutes or more. 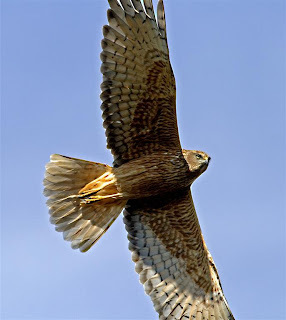 Finally, after much ruffling of feathers, it took flight, almost straight towards me and away over the hillside forest. I suspect this bird is a regular along this piece of coast, probably nesting nearby, and has become accustomed to vehicles and the presence of people. For me, it saved an otherwise forgettable morning. I briefly mentioned in the previous post, that, for whatever reason, the South Arm Neck roost of Oystercatchers has moved to a spot close to the road. This roost, made up of non breeding Pied Oystercatchers and the odd Sooty Oystercatcher, numbering in all around 50 birds usually roosts along the edge of the marsh, about 500 metres away and well away from the road. As you can see from this shot, they are at this site, perilously close to the road, and vehicles are travelling, in the main and quite legitim ately, at around 100kph at this point. I picked one of their number off the road this morning, and the only surprising thing is that not more have succumbed. Possibly the present very high tides and strong winds makes this a better roost site. Unfortunately, this is the narrowest part of the beach, and they frequently spill onto the tarmac. I did try moving them, but they were back at this spot, very rapidly. I just hope drivers will slow down and avoid them, but I'm not holding my breath.